I am an enthusiast of BMW automobiles, and this is a mini "documentary" of my project of restoring and improving one example of a piece of BMW history. My curiousity about the E24 6 series vehicle grew to an admiration strong enough to purchase one to explore it's design and have some fun restoring and driving it. I've got to say that it took a while for me to warm up to driving it, coming from driving agressive "M power" models everyday, but as it transformed from "tired" to a practically new vehicle, I really came to appreciate it's smooth and fast character, and I enjoy driving it tremendously. It also presented opportunities to meet other enthusiasts at the Palms to Pines, Bimmerfest and Pacific Sharkfest gatherings. Refer to the various sections to see the details and photos of the work done. 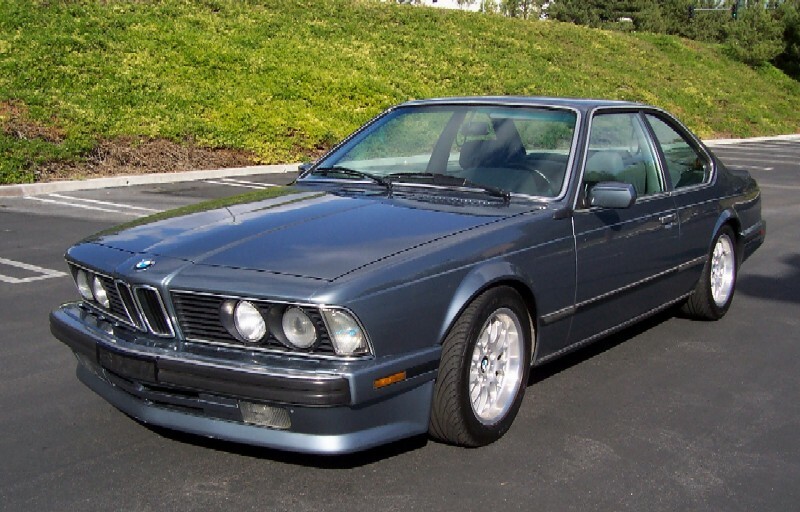 The car is a 1988 model year 635CSi with automatic transmission and 178000 miles on the clock. It is the last version of the model line so it has the smaller bumpers with body colored side valences and the engine is the last evolution with the highest power. The color is Cirrusblau metallic, and the leather interior is Silvergray. The engine runs strong and idles smoothly. It passed the California smog test easily and it doesn't use any oil. The transmission is the 4-speed electronic and it shifts smoothly. At the completion of the project the car looked and drove like new. All of the body trim was removed, any imperfections fixed, and after sanding and prep, the car was painted in the original Cirrusblau color. Many new trim parts were installed, including the kidney grilles and the rear euro spoiler. The bumpers were powdercoated silver. The car has the "halfline" interior - everything except for the instrument panel and upper side panels is leather covered, including the center console. The leather is in excellent condition, the driver's seat and passengers seat cushion were recovered. Anything needing attention was restored and dyed to match. All of the electric seat functions work. Radio, heater, cruise control, and sunroof all work. Mechanically the car drives like new. The engine received new ignition system parts and starter. The suspension was completely renewed: springs, shocks, all bushings, control arms, tie rods and center link. The SLS system was removed and mild lowering springs were installed to give the car the right stance. New wheels and tires were installed. The brakes were completely renewed and upgraded from the master cylinder to the wheels, including larger rotors and calipers. The drivetrain was renewed with a new driveshaft and upgraded with at 4.10 LSD differential. New fluids and filters were used throughout.